And here we are, the last day of September. I feel that the minute we go into October, life will start moving at warp speed, all in a rush up to the holidays. Oh it's my favorite time of year. 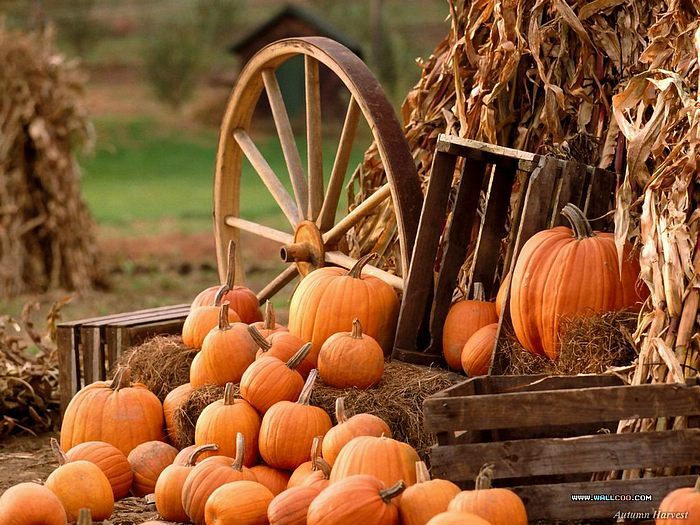 The shorter days, the cooler temperatures, Halloween and Thanksgiving and Christmas. 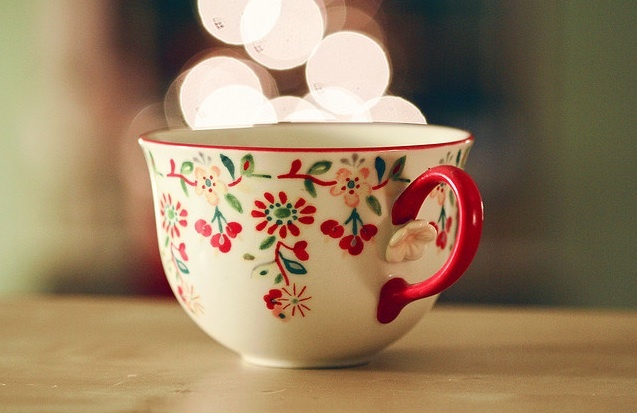 Early morning sunrises with freshly brewed coffee. This time of year I love to add different spices to it, whether cinnamon or nutmeg, or even pumpkin pie spice. It's this time of the year that I start fervently looking through all my cookbooks, in anticipation of cute snacks for the holidays, comforting dinners etc. Stepping outside to watch Autumn come into full bloom. Colors seem brighter, more vivid. And decorating, because it's so much fun to do :) Some spooky characters are starting to show up around the yard. My hubby had a college class most of the day, so it was just me and my kids at home. I took the chance to catch up on laundry, do a bit of cleaning up, bake a little and just take it easy. I do like weekends when there is nothing planned and we just go with the flow, leaving every hour of the day up to chance. I started the morning by making a batch of Homemade Laundry Softener. I love it, it works great and it's cheaper than store bought, plus as like Homemade Laundry Detergent, there's no added fillers or weird stuff in there. There's many versions out there, all you have to do is search the internet to find tons. I honestly can not for the life of me remember where I got the recipe, I wrote down the ingredients in a wordpad document......but, I think, if I'm not mistaken that it was from the Hillbilly Housewife. It's pretty inexpensive, especially if you already have the conditioner like I do. In large (microwave safe) bowl, mix the vinegar and hair conditioner together (it will look a bit clumpy). Place the whole bowl in the microwave and heat for a minute or two. This will ensure the ingredients will blend together more easily. Remove from microwave and stir. (I used a whisk). Add hot water and mix to make sure everything is blended. Pour mixture into a one gallon container and store in laundry room. Use the same amount you normally use in a rinse cycle (approx 1/2 cup). Note: Add to fabric dispenser department, downy ball or directly in the second rinse cycle. Before each use give the bottle a good shake to mix it up. One thing I will tell you, it does not leave a scent on the clothes like store bought, but honestly, it's fine with me. It does the job. Found a fantastic blog all about healthy low calorie cooking and I was in heaven. I decided to go back to counting calories so I can drop these 12 pounds that are driving me crazy. Starting Monday I'll be fully counting calories (though I've already been doing it the past two days), and I'll also be doing the 30 Day Shred again, last time I did it, it worked great for me. I've also been menu planning and I took about 2 hours today of going through this blog and bookmarking almost every single recipe I found. Can't wait to make them. One that caught my eye today was the Skinny Coconut Macaroons, so I baked some this afternoon, and they're almost gone. Oh boy. It's one of my favorite things on earth.....and hubby's too, and Jasmine's. Nic doesn't like coconut. Maybe it's due to this time of the year. Watching the trees drop their leaves to the ground, as if shedding the past and getting ready for the future. I sort of feel the same way, like I need to let go of some things and start new. I have never made it a secret that there are things in my life I am not happy about, or rather, one big thing, which is where we're at. I'm not a fan of Arizona, I didn't want to come here, I still can't stand it, and everyday I have to force myself to look it at through different eyes, to try and appreciate what I see, what is around me. To remind myself that I may not be where I want to, but I am with WHO I love and that has to count for something, it COUNTS for something. But letting go and letting God is one of those phrases that I tell myself constantly. And it doesn't just relate to this particular issue, but to everything I do in my life. Some people make it seem so easy, and I envy their faith, their way to be able to really take that phrase to heart and do what it says without looking back, without question, without doubt. And then there's me. Letting go is hard. It is SO very hard. It goes against every fiber of my being. It's that nagging little thought in the back of your mind, that little doubt that creeps up and stops you in your tracks, every.single.time you make progress towards being free of worry. Your mind really can become your worst enemy. You know, I had to stop and tell myself that it's ok to just stumble along, it's ok to feel overwhelmed and helpless and like I'm not in control, and that if I let go the world will not cease to exist in that very moment. I think deep down I am slowly realizing that the biggest issue of letting go, is that I will have to completely let go of the need to be right. Of the need to feel that only I can fix things and only I can do what is best for me. Because really, who else but myself would have MY best interests in mind? So I'm learning, I'm plodding through and I'm trying my best to be content with everything in my life, including and more importantly, being in the moment of where I am in this point in time. I am just like everyone else when it comes down to it. Living life, trying to do my best, failing miserably at times but always pushing myself to continue and not be consumed by the negative feelings that sometimes threaten to take over. I'm not perfect....I don't want to be perfect, I just want to be me. Even though the temperature hasn't dropped enough for me to be truly happy, just finally getting below 100 degrees is enough to bring a smile to my face. I seem to have more energy during the Fall. More umphf, more something, I don't know....all I know is that I tend to tackle my days with a renewed joy. regrowing lettuce, even if it seems hard, it really isn't. Cut off the end off the lettuce, pop it in a jar and fill just the bottom with water, then watch it pop to life. I have this wonderful show to share with you this morning. 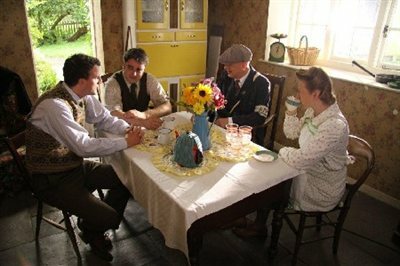 I know, I do tend to share a lot of shows with you all, but I think that if you're a fan of programmes such as Edwardian Farm, Victorian Farm, 1940's House, Frontier House etc......that sort of thing, you will really enjoy this one. But it's not just because it's a show along those lines that has captivated my attention this time, it's the story behind it, the theme, the nitty gritty of what they're doing. 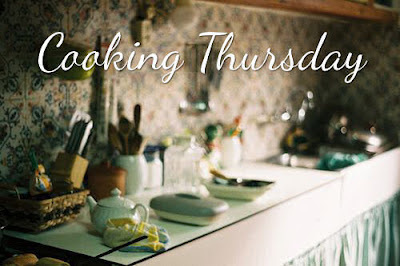 Do you remember the post I made a while ago about Rationing and the Wartime Kitchen? Aside from loving history, I have a special love for wartime or more specifically WWII history and I guess since I adore England, the pull towards it's history during this time, is even bigger. 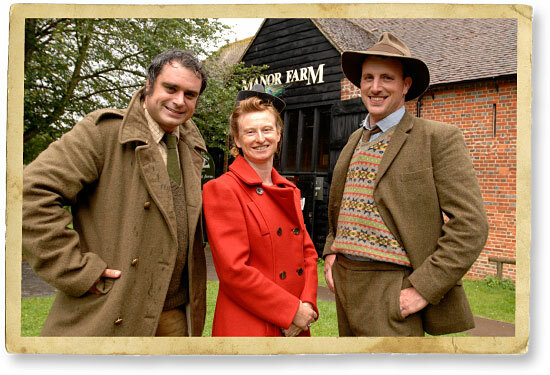 With that in mind....The same 3 people who did Edwardian Farm and Victorian Farm, as well as Victorian Pharmacy are back in this new series.....Wartime Farm. And as the title may indicate, it's 1 year living on a farm during WWII, rationing, depression etc. I'm completely fascinated with it. But wait.....let me tell you why this particular series is having an even bigger impact on me. It's amazing to see people get through hard times, to conquer the obstacles, to be determined to not let circumstances and things out of their control take over their lives. I keep thinking about how I would react were we to suddenly find ourselves rationing food, having to grow our own, surviving through war right at our front step, and helping others when we don't have that much for ourselves to begin with. That right there speaks volumes to me. 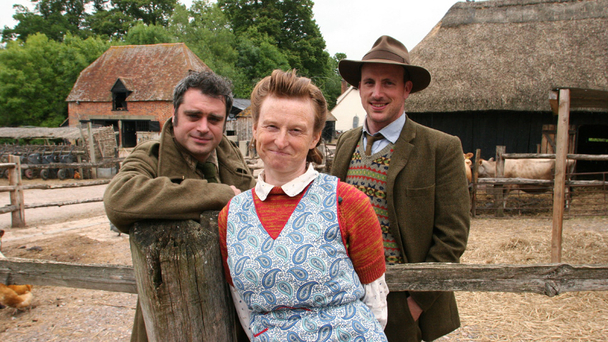 The fist episode, which you can watch either on BBC iplayer or here, touches on the 3 experts arriving at their farm, seeing what they will have to deal with and setting up home. Honestly, watching her set up the kitchen had to be my favorite part. 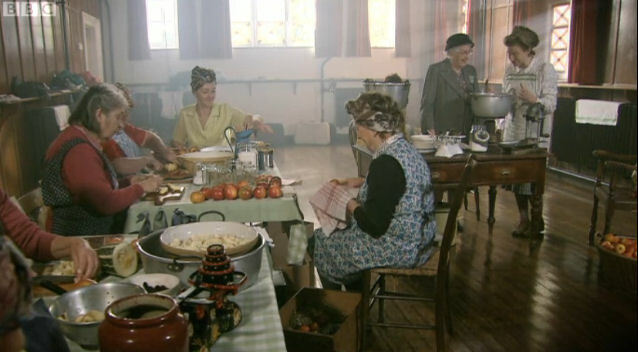 I would be in heaven in an old simple kitchen such as theirs. But in the middle of all this, we are learning about their individual roles and what exactly was expected from farmers and their wives, and let me tell you that it wasn't just growing food to help the country, they were expected to do other tasks that weren't exactly seen innocent.....but they were kept secret, many times from each other. Episode 2, starts going a little deeper into what they do. Having to get rid of livestock and moving more towards growing the food. We see the beginning of a Pig Club (you'll have to watch to see what it's about), we get a really good look at rationing and exactly what they got per week. A homemade slow cooker, no kidding...I am TOTALLY going to try this. And canning....YES canning. Now that caught my attention. You can watch episode 2 on BBC iplayer or here. And Episode 3....Christmas and how to make do with what you have. I think from the previous episodes, this one really spoke to me. People didn't have much money, there was really no way to buy extravagant gifts, so it all came down to handmade. Decorations, a mock turkey, gifts, helping families during the war, making beds, making comforters etc. You can watch this episode on BBC iplayer or here. I guess what I'm trying to convey, is that I've already been feeling the push to have a simpler Christmas, to make more handmade things, to really concentrate on what the season is about, rather than the amount of money that is spent on each person. It's not easy in a day and age where everything seems to be so monetary, so focused on how much rather than if you really need it or not. It's really made me want to take some of the examples given in this series and apply them to my own home. No one says you can't have a beautiful, simple, modest Christmas without all the bells and whistles, and that is exactly what I'm determined to do this year. 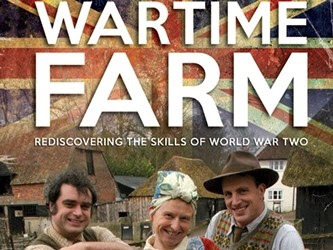 So, if you're looking for an educational, fun, interesting series to watch that the whole family will enjoy, you just have to give Wartime Farm a try. Today's recipe is one of our favorites. Usually I make it with Chicken or Veal, but this time I decided to try Pork and it's just as delicious :) Give it a try sometime. Layer tomato mixture, pork, mozzarella and 1/4 cup parmesan in prepared baking dish. A few years ago I did a 31 Days of Autumn, where every single day I shared a picture that said Autumn to me...whether it was a leaf, or the color orange, or an apple fritter. Whatever showed me that it was that time of the year. I should rather say, it was supposed to be an every day thing but then life got in the way and I fell off the bandwagon.....in my defense though I didn't have a great camera and I didn't really take too many pictures. Fast forward to today, and I think I'm ready for the task. Starting on Monday, the 1st of October, I will do a daily 31 Days of Fall post and share a picture of what around me is screaming fall. I figure since I'm posting every day anyway, may as well challenge myself to really capture the season. Won't be very easy considering I'm still in Arizona, but I'm always up for a challenge, so this should be fun. 8pm.....starting to slow down, thinking I'll give the crochet a rest and watch a little tv with the family before bed.